The first song that we were treated to from Nas’ new album Life is Good was “Nasty”, just over a year ago. Yes it was great to her some new solo material from Nasir Jones and it was good that it had an authentic Hip Hop feel to it – but those were the only good things about it. “Nasty” is only included on Life is Good as a ‘bonus track’ and even that is an honour too far for a song that is so bad. The first real taste that we got of Life is Good was “Daughters”, a personal tale about fatherhood not so often seen in Hip Hop music. The song that truly set the mood and anticipation for Nas’ tenth studio album was “The Don”. The song leaked five months after Heavy D’s death and Nas included a nod to the late rapper & producer “Heavy D gave this beat to Salaam for me to rap to” - more reason to like this banger! “Loco-Motive” is another of the album’s tracks that are, as Nas put it, “for my trapped in the 90's niggas." The production and song structure have a 90’s Hip Hop feel to them, Nas’ flow and raps make it feel even more authentic. Nice. "A Queens Story" is quite misleading in that it’s not really a story. The song is a bit more like a sightseeing tour through Queensbridge’s ghettos by Nas. This is one of the rare occasions on Life is Good when the beat is better than Nas’ bars. I’m sure that Queens natives and their fellow New Yorkers will be able to relate to this song but as a Londoner with not much interest in taking such a journey, this song wasn’t the most enjoyable. "Accident Murderers" is Nas’ latest collaboration with Rick Ross after their earlier poor effort “A Tower Heist". It is funny that Rick Ross is on this track considering his past as a prison guard. Ross however delivers a show stopping verse and the beat change in his verse is brilliant. Nas' last verse raises some of the harsh truths about gun violence. How they gon' kill that beautiful sista? Nas shines on the Anthony Hamilton assisted “World's An Addiction” and his second verse is the song’s highlight. It is a shame that after a good run of tracks, “Summer on Smash” pops up and ruins proceedings. “Summer on Smash” is a bad generic 'summer banger' and everything about it feels forced. Swizz Beatz' chorus is awful, Miguel's rap verse doesn't deserve a place on a Nas album - let alone Justin Bieber's and Nas struggles to add anything worthy to this mess. Fear not as we return to the scheduled programme – Nas’ lyrical mastery on the Victoria Monet assisted "You Wouldn't Understand". Nas addresses some of the harsh truths that pretenders and wannabes have yet to face up to. Nas is again lyrically brilliant with rhyme schemes and loads of detail on “Stay”. Nas speaks of keeping your friends close and your enemies closer. No I.D.’s production on this is brilliant, the perfect platform for Nas’ bars. On "Cherry Wine" Salaam Remi’s production Nas’ lyrics and Amy Winehouse’s vocals are on point. It is a shame that Amy won't be around to give us more gems like this. Nas speaks openly & honestly about his marriage & divorce with former wife Kelis on the album’s final track “Bye Baby”. 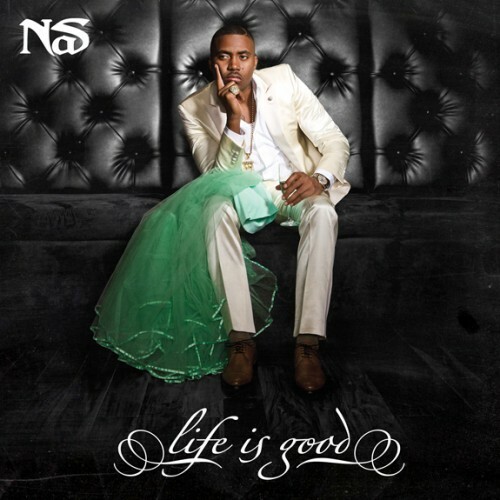 The song is also linked to Life is Good’s artwork which features Nas sat with Kelis’ wedding dress. The significance being that it was the only item Kelis left after removing all her stuff from their shared home. Deep. “No Introduction” and “Reach Out” which features Mary J Blige are both nothing more than average and much like “Summer on Smash”, listening to any of these songs is not the best way to spend four precious minutes of your life. Anyone that hadn’t heard Nas’ verse on Rick Ross’ “Triple Beam Dreams” or Nicki Minaj’s “Champion” may have doubts as to whether Nas has still got it. Life is Good reaffirms why Nas is widely hailed as one of the best rappers of all time. When Nas is in full flow it is something to be awe of and enjoyed. The rare occasions when Nas strays from his comfort zone on the album, are uncomfortable to listen to. Is it as good as Illmatic? Is it the best album of the year? No and no! There are enough good tracks and brilliant tracks (the latter of which are above under 'highs') on this album to ensure enough replay value to last the next two to four years until Nas releases a follow up. To view a guide to Best In New Music's Album review rating system click here. Life is Good is available to buy now on iTunes UK & iTunes US. You can also stream Life is Good on Spotify.